Find out more at Bata Shoe #Singapore. The Online Game can be played online or at the kiosk in Bata Peninsula Plaza store from 7 April to 7 May 2017. The Online Game is open to all participants residing in Singapore and those on a short-term visit to the country during the campaign period. Employees (and their immediate families) of Bata (Singapore) Pte Ltd (“the Company”), their advertising and design agencies, distributors and partners are not eligible to participate in the online game. Prize redemption (Bata vouchers only) is applicable at all stores except Changi Airport Terminal 3, and redemption must be made by 7 June 2017. Redemption of all other prizes must be made by 7 May 2017 in Bata Peninsula Plaza store. All prizes are not transferable or exchangeable for cash. The Company reserves the right to substitute the prizes with others of equivalent value without prior notice. All pictures shown on the prize cards are for illustration purposes only. The Online Game can be played online or at the kiosk in Bata Peninsula Plaza store from 7 April to 7 May 2017. 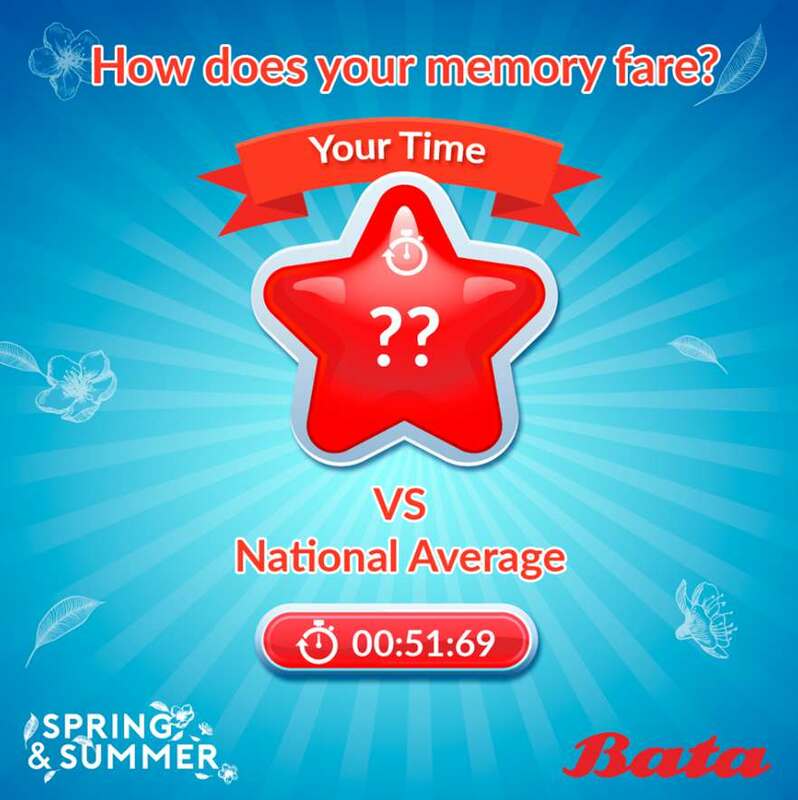 To play the Online Game, Participants will need to click or tap to overturn 20 cards featuring 10 different pairs of shoes from Bata’s Spring & Summer Collection. Match and pair up cards with the same pair of shoes within 90 seconds to complete the game. Each Participant or NRIC/Passport number is only allowed to play the Online Game once. All Participants who have successfully completed the online game will be notified via the email address submitted at the start of the game to inform them about the prize redemption process at Bata Peninsula Plaza’s in-store Gashapon machine. Participants are to scan their NRIC or Passport at the Bata Peninsula Plaza’s in-store Gashapon machine to redeem their prize card. Participants will need to proceed to the Level 1 cashier counter with their prize card (except for Bata vouchers, which can be used as is at all Bata stores in Singapore except at Changi Airport Terminal 3) to exchange for the actual prize that they have won. The Company reserves the right to refuse participation for any ineligible Participants. Personal data of Participants will be collected as the company deems fit. The company shall reserve the names and particulars of the participants for their own internal usage only for this Campaign. The Company’s decision on all matters relating to the redemption process shall be final and binding. The Company shall not be obliged to enter into any correspondence concerning the Campaign. The Company reserves the right to withdraw, discontinue or terminate this Campaign at any time at its absolute discretion, without notice or liability to any person. The Company, its related corporations and/or employees shall not be liable for any loss or damage arising in connection with the Campaign, including without limitation, any illegible entry forms, error in computing, any computer system or equipment breakdown, electronic malfunction or any notice which is misdirected or lost in the post. The Company reserves the right in its sole and absolute discretion to exclude/disqualify any person from participating in this Contest without any obligation to furnish any notice and/or reason. The Company reserves the right to amend the terms and conditions as it deems fit. All redeemed Prizes are non-transferable, not exchangeable for cash, credit or any other item and shall be subject to such terms and conditions which the Company and/or the relevant vendor, merchant or supplier of the goods or services may at its/their sole and absolute discretion impose. The Participant agrees to abide by those terms and conditions. The Company may, in its sole and absolute discretion, vary, modify, exchange or substitute any Prize or any term or particulars of any Prize without liability to furnish any reason and/or notice to any person. The Company and/or the relevant vendor, merchant or supplier of the goods or services shall determine the color, style, any fittings, fixtures, packaging, accessories and/or form of the Prize, as appropriate. The Participant shall accept the Prize “as is” and the Company shall be under no obligation to entertain any request by the Participant to change any aspect of the Prize. The Company makes no representation or warranty whatsoever as to the quality or fitness for purpose or any other implied terms and conditions with respect to the Prize awarded in the Online Game, and the Company shall not be held liable for any loss, cost or damage to any person resulting or arising from any of this Online Game’s Prizes or the use of it. The Company shall notify the Participants of the location where the relevant Prize is to be claimed. Participants will have to produce and scan their NRIC or Passport to collect a Prize card at a Gashapon machine in Bata Peninsula Plaza store before they proceed to the cashier to exchange the Prize card for the actual Prize. Without any liability on the part of the Company, any unclaimed Prize within the given period will be kept by the Company for future uses. Any Participant whose Prize has been so forfeited shall not be entitled to any compensation notwithstanding non-receipt by him/her of any notification. The Company reserves the right to vary, delete or add to these terms and conditions at any time in its absolute discretion without notice or liability to the participants of the Campaign or any other person. The Company’s decision on all matters relating to the Online Game or the interpretation or implementation of these terms and conditions shall be final and binding on all Participants. In the event of any inconsistency between these terms and conditions and any brochure, marketing or promotional material relating to the Campaign, these terms and conditions shall prevail.